Brophy Estates proudly presents this magnificent property to the market. Very rarely does a property of this calibre become available for sale; it represents a once in a lifetime opportunity for a discerning purchaser. 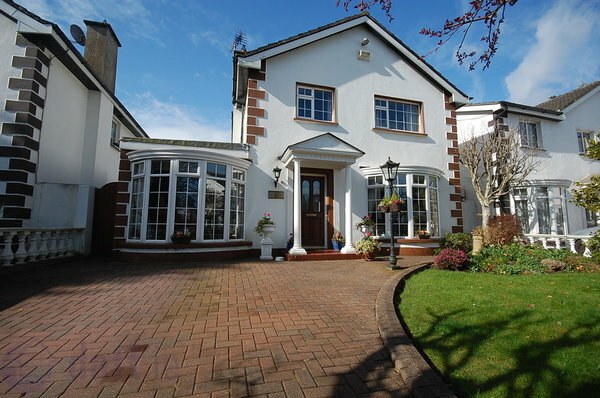 A rare opportunity to acquire a substantial 4 bedroomed detached family home located in an exclusive cul-de-sac within a prestigious residential location, just 15 minutes walking distance from the centre of Malahide village and every conceivable amenity including shops, schools churches, restaurants and DART. 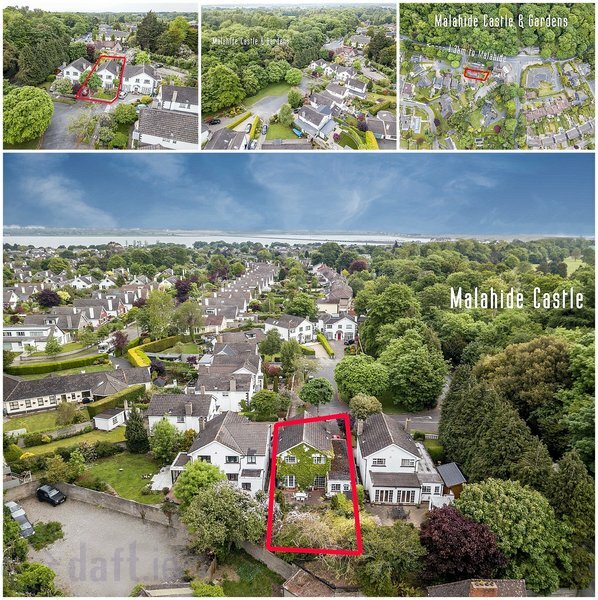 The property is located opposite the historic Malahide Castle. 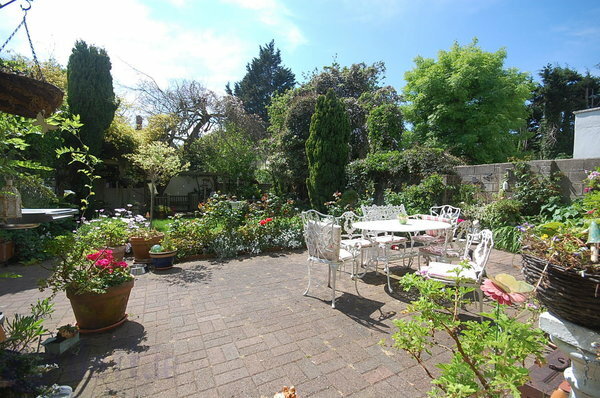 There are many wonderful features throughout the house most notably the feature fireplaces, ornate cornicing and coving and a large South face rear garden, the grander, charm and character of this property is palpable on entering. Entrance hall (5.14m x 2.07m) Mahogany flooring & solid wood wall panelling. Separate Living Room (6.04m x 4.33m) Bay window, gas fire insert with marble surround, decorative coving and cornicing and an open arch to the dining room area. Separate Dining Room (3.93m x 4.33m): Decorative coving and cornicing, access to patio area. Kitchen (5.04m x 3.97m): Extensive kitchen with ample tiled counter top space and wall units, mahogany flooring and breakfast area. 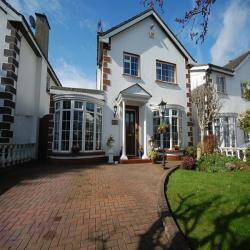 Family Room (5.78m x 2.69m): Bay window, solid fuel stove and carpeted flooring. Utility (2.04m x 1.74m): With wall units. Guest W.C (2.04m x 0.89m): Tiled flooring and solid wood wall panelling. Master Bedroom (4.45m x 3.84m): Built-in wardrobes + ensuite bathroom. Bedroom 2 (3.56m x 2.70m): Built in wardrobes and floor carpet. Bedroom 3 (3.23m x 2.91m): Built in wardrobe and floor carpet. Bedroom 4 (3.23m x 2.60m): Built in wardrobe and floor carpet. Main Bathroom (2.26m x 1.79m): Fully tiled. There are quality bathroom fittings throughout the house, a mix of carpet covered and tiled floors, a mix of plastered and painted/ wallpapered wall and ceiling finishes and ornate coving throughout. The property has the added benefit of a sunny south facing rear garden, which fills the rooms with sunshine from morning to evening. There is a large paved driveway to the front with ample space for parking and a side passage. This is a fantastic opportunity to acquire a large family home oozing with style, sophistication and character with a commanding, prestigious address.